kAlx kP-1060 Injection Mortar is a purely mineral product composed of high quality, lime pit, slaked lime. In addition to injecting cracks and voids, kP-1060 can be used for sealing superficial cracking, securing tiles and pointing very narrow joints. Due to it’s consistency, tooling may include medicinal syringes, caulking guns or pumps. 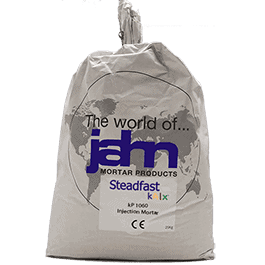 Please Note: kP-1060 Lime Injection Mortar should not be used for sealing constructional cracking. For this type of cracking please refer to the Jahn M30 Injection Grout and M35 and M40 Injection Mortars. Supplied ready to use. Hardly any water needs to be added.